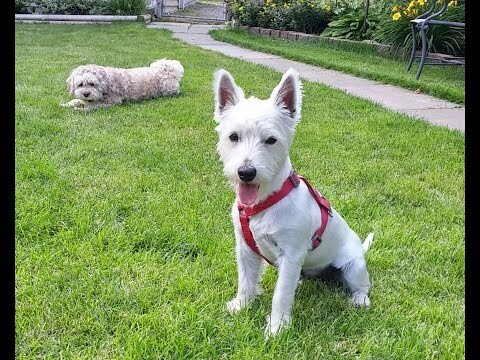 Making new doggie friends during their stay at Furever Home Pet Care, here’s how Lucky from Lebanon and Harris the Westie are getting along! Both these doggie friends are living it up while their people are away! McGee the Chi is right in there showing them how to make best use of the dog friendly back yard. When you look for quality dog boarding, a safe back yard makes for a great dog vacation. Not only does it help all the visiting dogs and the resident dogs get along, it helps burn off nervous energy and tension. Lucky and Harris happily romped all afternoon, then after dinner continued on in the kitchen. Finally, they both crashed and slept comfortably all through the night. Up at the crack of dawn, we’re guessing we’ll have some terrific entertainment this weekend with these two! Quality time includes lots of romps, walks all over the neighbourhoods, some forays onto the hiking trails, and of course down time to recharge the batteries. Every dog is cared for just as if they are in their own homes, whether the stay is just a day, overnight, or long term. Furever Home Pet Care only takes two doggie friends at any one time, to ensure personal care and attention. Harris the Westie was booked through DogVacay.com, which allows traveling families to find quality pet care anywhere they are visiting in Canada and the United States. Harris’ home town is Minneapolis, MN. Check out our listing and read testimonials from our happy guests here. Lucky is one of our favourite repeat guests; his family is currently camping with a huge family posse somewhere way up in Quebec, and on his previous stay with Furever Home Pet Care, his family had traveled to Chile!